Virtual World Characters – Both in worlds and out. Generation Pixar – Designing Psychotic Lamps for who? Once we celebrated design that solved problems for people. Like having “light” to see by in the darkness… Today we celebrate creating machines with psychosis’ and we expect a better tommorrow via a faith in technology. This is how Matrix’s are born. The thing that most will have to “learn” about “virtuality” and “virtual worlds”… It’s always going to be HOLLYWOOD baby! Even if you think your’e educating k-12 or trying to revive Comdex. When Google has closed down and fired the “video kids” studio it’s dancing around buying this month, the Dream and the path to Digital Realities will still be the same as when AOL, or Yahoo did the same. IBM to Patent “Not Bumping your head on a Virtual Ceiling? Hypergrid Business has just published an article detailing specific design principles incorporated into our “IBM Learning Commons” virtual world learning environment. With no solid walls or traditional buildings to speak of this environment is really about connecting people and social learning. It’s a radical departure from what designers usually start building when they first get into virtual worlds. Instead, we’ve left out real world elements that didn’t provide any significant value to the user experience. The exception of course is when you are trying to provide a contextual environment for learning. But this doesn’t need to be a whole office tower or city block. In this case we bring the right-sized environment to the learner and instantiate it on demand when it’s needed. Sound interesting? Take a moment to read the article and let me know what you think. Larry Rosenthal • “Radical” and “patents” are strong “specific” words from “IBM”;). Maybe some prior art research is in order. The “design principles” you are speaking of have been used by many for 20 years in “online” 3D environments and are much older in environmental design work in general. • Delete • Flag as promotion . • Reply privately• Flag as inappropriate • Flag as promotion . Henry Watson • Ok, you got me on the dramatic “radical” comment :), but my point was that most of the learning builds I’ve encountered (and apparently those encountered by Hypergrid editors too) over the past few years do not exhibit these design principles. The patent mentioned was actually in reference to a methodology for designing virtual spaces in general and not those particular design principles discussed (I can see that wasn’t so clear in the article). Although the design principles may have been around for years as you say, unfortunately they aren’t applied as often as they could be to improve user and learning experiences. I hope to see more thoughtful design in virtual learning environments and would be interested to hear of examples where you’ve seen similar principles applied. A general patent on designing virtual spaces? Again an idea that I would think concerns many designers who exhibit careers and works going back way beyond 3 years of IBM interests and Second Life projects. Heres just one article on 2d/3d Virtual Design Principles published and republished many times online since 1996. Once for the DUX Confernece as requested for an event night presentation on such matters. I also produced a website for Showtime/ New Media Festivals/Labzone in 2001 all about web3d projects and designers/artists/ etc. I would say most of them applied similar principles to their works. In my position as editor, it was such applied principles that usually gave me cause to choose their works as valueable to others and warrent publishing. The attempt to make “good design methods” a patented – single controlled entity -“technology” is I believe why “unfortunately” will contribute to the continued lack of “thoughtful design” in virtual environments. Method patents are not quite what they “used” to be, for that, neither are we. Once… less was more. 😉 today Im always reminded that more means less. Amy Groves • Hmmm. Just to correct one point, IBM’s been involved with virtual worlds for waaaay longer than three years. Also, I do think that you have to really be able to dive into the specifics to be able to see what’s unique about this particular learning design. This is about more than how buildings are designed and constructed; it’s about how the design is driven by learning best practices suggested by research. The key word here is probably “learning,” not “building.” The sponsoring organization for this project was IBM’s Center for Advanced Learning. That having been said, thanks for the link to the Cube Productions article. Looks like interesting reading. John Jamison • It’s nice to see the continued effort of IBM to take a serious approach to virtual environments…when many others remain outside. And it seems to me that what is described in the article, while not exactly ‘radical’, may be a very sound approach for IBM, and the uses of the v-world that it anticipates for it’s culture. But as out here in carbon-based land, it is going to be extremely difficult to agree on a common set of design and usage guidelines that will translate to all groups. I have been active in research and development in v-worlds for about six years now, completed my PhD research on virtual environments, all focusing primarily on development options for education and training. We hold meetings, develop interactive simulations, create authentic assessments…along with a range of other activities, looking at how to “do” learning in new ways made possible in the v-environment. For our needs, our list of guidelines would look different than those of IBM. While ‘connecting’, and ‘social learning’ are certainly a wonderful part of the virtual environment, the over-riding focus for us is using the environment to create unique and meaningful “learner experiences”….which may or may not include social interaction…depending upon the situation and objectives. The virtual environment lets us manipulate so many modalities and sub-modalities that we can engage learners as never before. For our needs, we’re not focusing establishing guidelines about whether there should be ceilings, walls or chairs, or consistency. These are all good things, and apparently fit IBM’s needs very well. That’s outstanding. But we are looking the environment as a responsive place in which we can create authentic interactions with new learning, and when it contributes to learning, interactions with each other. It’s a great time and place to be involved…keep up the great work! • Reply privately• Flag as inappropriate • Flag as promotion . Larry Rosenthal • Hello Amy. “3.5- 4 years” was the articles “Hamilton’s” assertion. not mine. 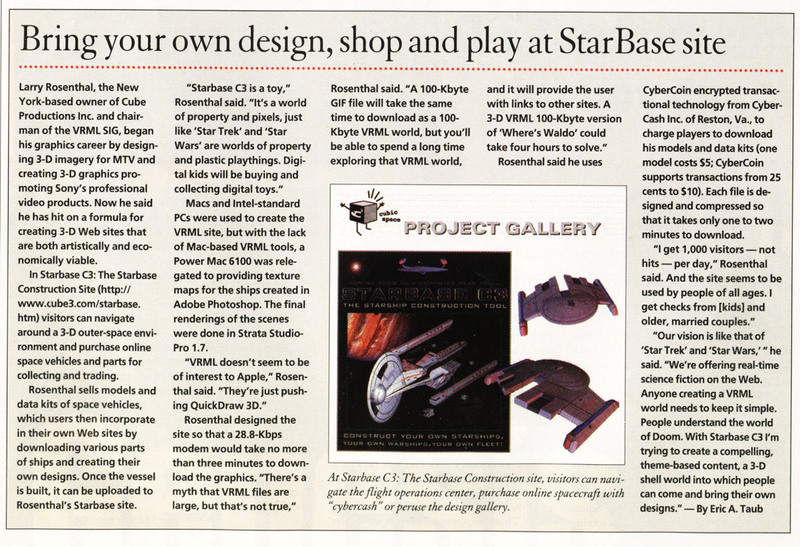 In terms of “web3d” media ( virtual worlds can mean another thing imo) I do remember working with IBMs “hot media? metal” back in the 90s. ;) with an author on a book about web3d media. Again I have no knowledge of what IBM plans to attempt to patent or not, only the article and comments here to react to. I do know that “learning” and “design” are broad terms, and that “best practices” are usually considered with marketing terms rather than patents. Interface design using real-time 3d media has been around commercially and in academia for 20 years plus. I’m sure certain aspects people have used may be called unique, as to the strength of /or business politics of particular patents, either granted in the past or future, one can only confront them, when they’re public or an issue to a concerned party. I’ll end with “Education”, and specifically “the educational results” using 3dmedia does demand us to do better, since the majority of experiences presented using the medium has come tangentially from the game and entertainment industries for the last 20 years. David Miller • Hmm, I think amphitheatres pre-date IBM . . Okay, sorry, it is far to easy and tempting to pick on IBM. 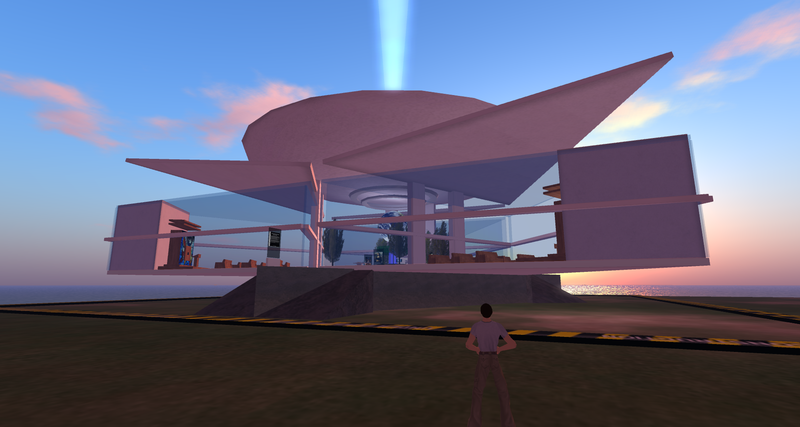 IBM has poured 10’s of millions into virtual worlds and are a big reason we have working hypergrid teleports in OpenSim. Thank you IBM for the resources, both in money and talent, that have furthered virtual worlds overall. It is very tempting to build in traditional ways and that is often rationalized as helping to “suspend disbelief” for learning scenarios. Good virtual world building means taking into account those factors in virtual worlds taht affect user experience. Things such as ceiling heights. Unless you change some debug settings, walking into a space with 8 foot ceilings without being in mouselook is terrible. Same for landing areas and what Henry was pointing to. Of course, the purpose of your environment is the latgest driver for design. I do middle school science work so a desalination plant needs to approximate a real one to an extent. Even with 4 years experience with 19 sims in Second Life and now a private OpenSim grid, I still want to base my builds on pseudo-real architecture. I have a fully floating lounge 200 metres up that I built two years ago and I still struggle with the concept of it in my head! Hats off to you IBM for continuing to research and develop virtual worlds and contributing to my enjoyment of them! Amy Groves • David, thank you a million times for pointing out how easy and tempting it is to pick on IBM. I can’t tell you how challenging it can be sometimes to engage in meaningful public dialog without sinking into defensiveness. Ultimately, what we’re really trying to do here is share our work with people so that it will do some good. Your example of the eight foot ceilings was interesting to me because it’s a really good example of what I think Henry was referring to when he wrote that Learning Commons is “a radical departure from what designers usually start building when they first get into virtual worlds.” I still think Henry was correct in his statement. To this day I still see new builders putting in eight foot ceilings. Learning Commons has almost no ceilings or doors, except in certain very specific cases in which we require a realistic environment for staged role plays. I think the trick here is to provide the correct degree or verisimilitude for the type of learning that is being offered. Another thing that we see new builders doing all the time, and which I think continues to be a danger and a bother even to experienced builders, is overbuilding. In Second Life it’s so easy to build that we become our own worst enemies. With Learning Commons, we looked at requirements gathered from over 40 different internal learning programs and pilots, distilled them into a set of common basic requirements, and built from that. What we found is that by making our spaces highly configurable by the learning facilitators or instructors, we could satisfy 85-90% of the instructional designers’ requirements within only two contiguous regions, not a lot of prims, and a limited texture library. People have noticed that IBM currently maintains only a fraction of the 40+ regions that we once maintained. It’s not because we’re less interested in virtual land; it’s because we have finally learned what to do with it — particularly for adult corporate learning. Our build is uncluttered, in keeping with our desire to minimize cognitive overhead. At the same time, our design conveys a sense of openness because we wish to encourage the social and informal learning which is such a big part of how adults learn in a corporate environment. It takes a lot of meetings and a lot of field testing to get the balance just right. • Reply privately• Flag as inappropriate • Flag as promotion . Larry Rosenthal • Please. Give us a break. Picking on a multibillion dollar corporation? One that today has it’s employees publically posting about Patenting the obvious fundamentals to the design processs that trained designers for a century have passed on as ” free Knowlege and eperience or as formal education” not Patent licenses..I dont expect much agreement on forums like this anymore, thus isnt that the real problem with this meta “virtuality” that we have- ahem IBM? to be “grateful for” ? This thread was started by an IBM employee. Asking for thoughts.Too bad My thoughts were about the “patent” statements in the article as well as “radical” aproaches that clearly are not radical or new for professional designers.- and thus the patent statement seems to be “one” of business politics, and not any “faux altruism” for others, even those like David. IBM “Patenting” Virtual World’s Design Principles and Methods? Where does one start?.. Maybe with Prior Art… With that “I” think “we” can offer some rebuttle to the “depth” of “non obvious” for the last “few” years of prim bending “expertise” IBM employee’s “discovered” in Second Life. I hope this is just bad reporting or just dumb PR from an IBMr looking for a new job or blogger pundit deal. ;) Patenting Design methods and principles that seem to have been taught in Design schools (like Pratt) for a century, just because today’s non thinking /or paid off Patent Officers are still afflicted with MIPS – Media Induced Psychosis. ;) is getting ridiculously dangerous in our society today. “One click Patents” and “information” wanting to be free– and tools licensed not owned… are all not good omens for the future of Design. Two Images of the Unity Center under construction at the CubicSpace Sim in Reaction Grid. 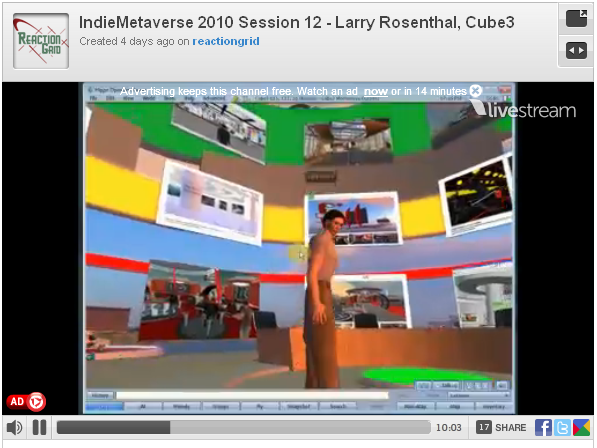 Ill be giving a tour on Friday at 10:30 am EST as part of my demo at the IndieMetaverse Meet in Orlando.